Serials actions can be accessed by going to the ‘More’ menu at the top of your screen and choosing ‘Serials’ or by clicking ‘Serials’ on the main Koha staff client page. The Serials module in Koha is used for keeping track of journals, newspapers and other items that come on a regular schedule. As with all modules, make sure you go through the related implementation checklist before using the Serials module. Koha keeps a record of publication frequencies for easy management and duplication. Everytime you create a new numbering pattern in serials you can save it for later use. These patters are accessible via the ‘Manage numbering patterns’ page. This page will list for you the numbering patterns you have saved in the past as well as a few canned patterns. If you have upgraded from a previous version of Koha you will see ‘Backup patterns’ listed for patterns used in version before Koha 3.14. This is how Koha saved your old numbering patterns. You can edit these to give them more meaningful names from here. 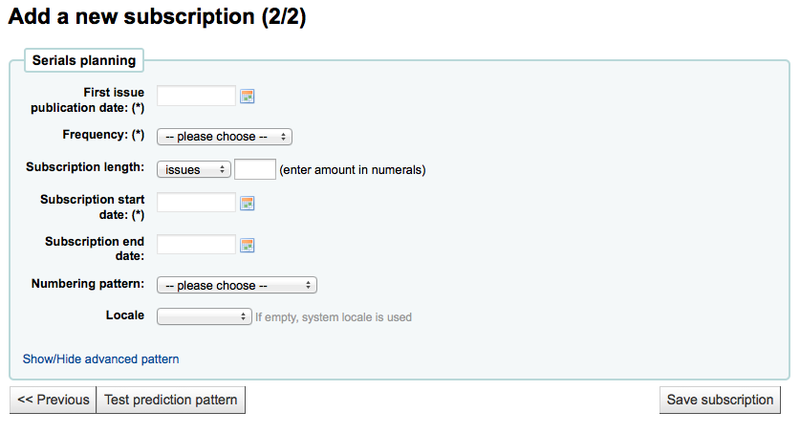 It will also allow you to create a new numbering pattern without first adding a subscription. 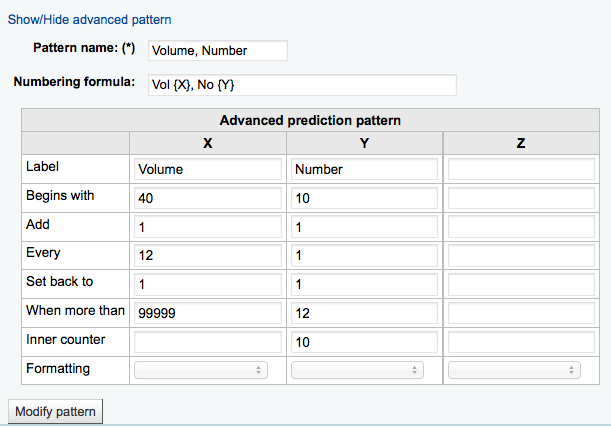 To add new new pattern click ‘New numbering pattern’ at the top of the list of patterns. 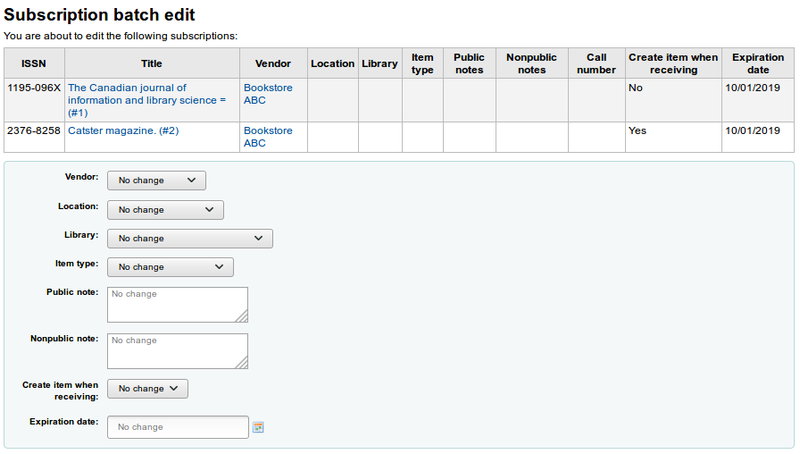 This module will allow you to add custom fields to your serial subscriptions for reporting and searching. Authorized value category: you can use authorized values to fill in this field. You can only choose one of the two options. If you choose the authorized value option, you will be able to fill in the new field upon the creation or modification of the subscription. 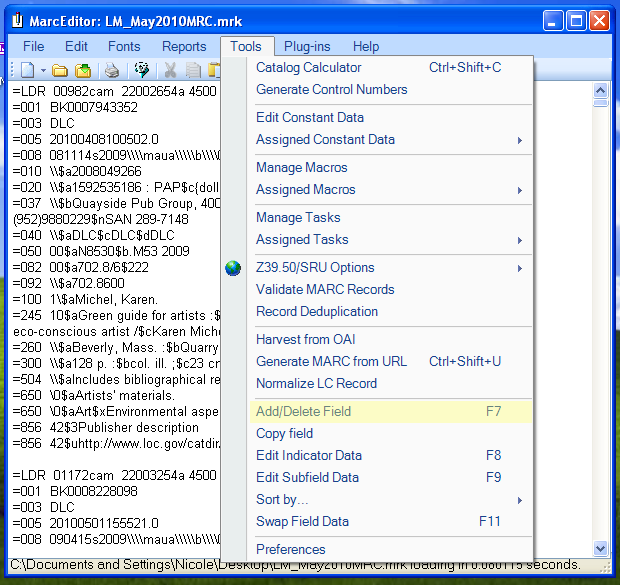 If you choose the MARC option, the field will be automatically populated with the corresponding record’s value for this MARC field. When you are adding a subscription, the field will be in the ‘Additional fields’ section with its authorized values drop-down menu. 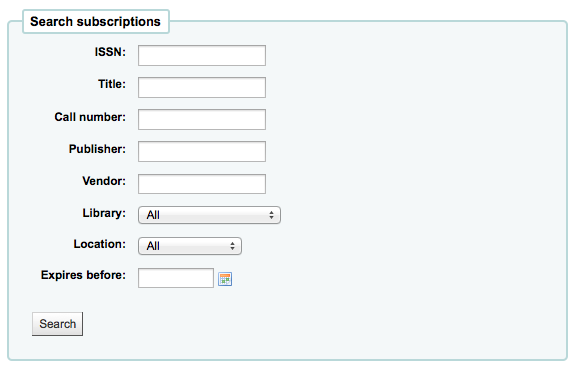 When you view the subscription, the field will appear under ‘Additional fields’. 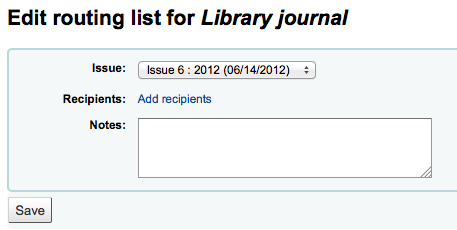 Because we made the field searchable, it will also be in the serials subscription search. 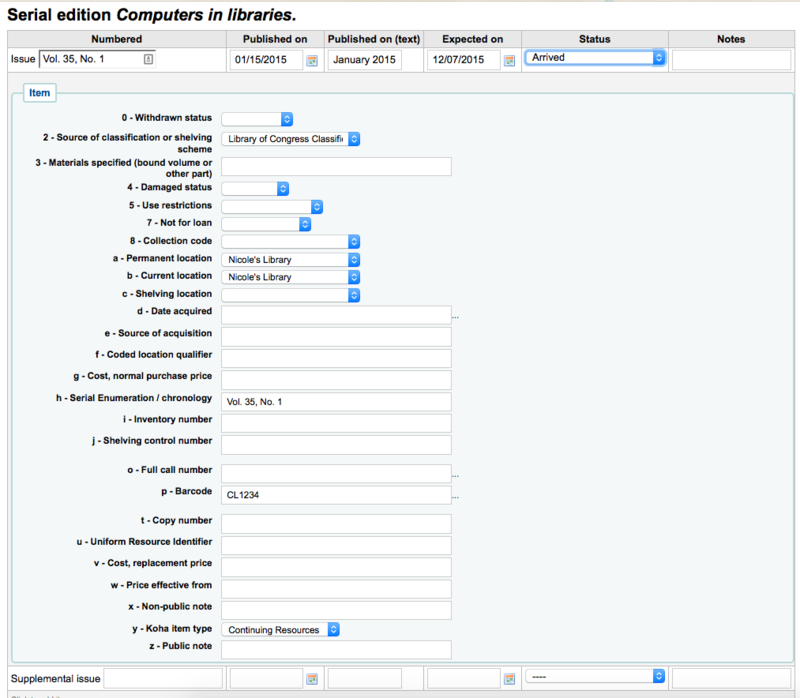 This is particularly useful if you want to view bibliographic information in the subscription detail page. 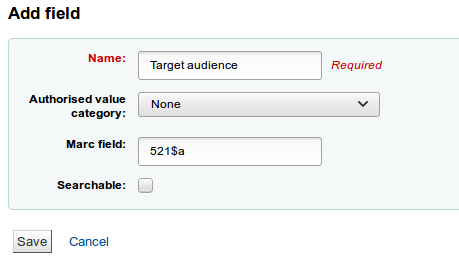 In this example, we will add the 521$a field, which is, in MARC21, the target audience note. You will not be able to edit this field from the subscription form. 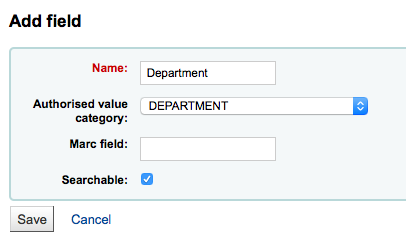 If you need to add or change the value in this field, you must go through the cataloging module. 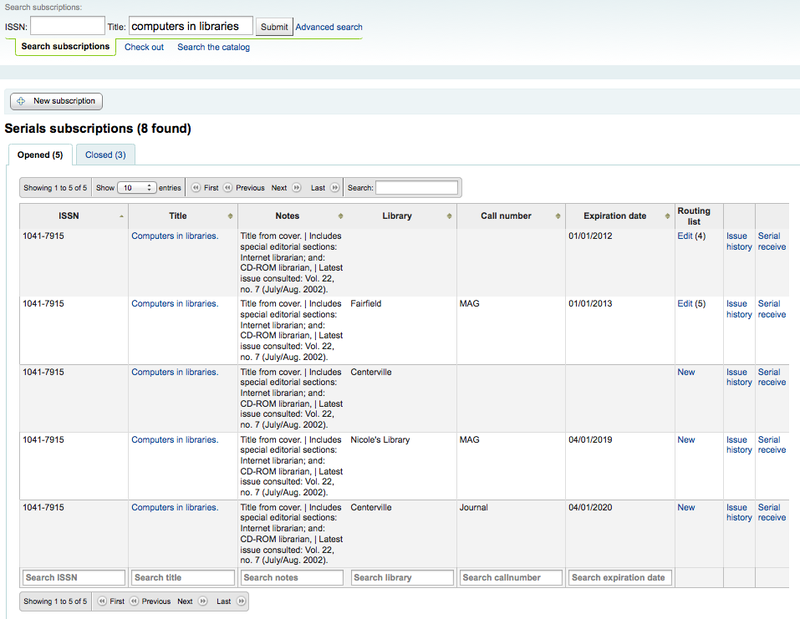 When you view the subscription, the field and the information from the bibliographic record will appear under ‘Additional fields’. If you are entering a new subscription from the Serials module you will be presented with a blank form (if creating new from a bibliographic record the form will include the bib info). This can be done by searching for an existing record by clicking on the ‘Search for record’ link below the boxes or by entering the biblionumber for a record in the first box. Only if you search will the field between the parenthesis be filled in. 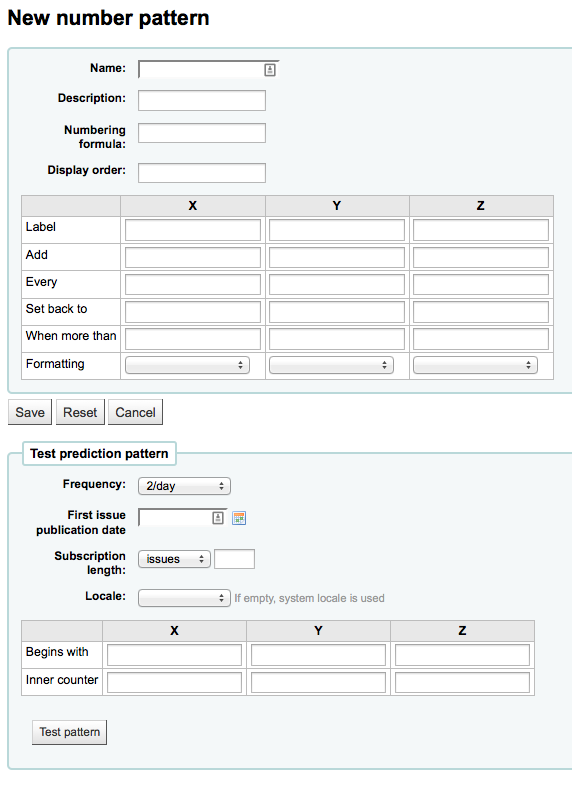 Checking the ‘Manual history’ box will allow you to enter serials outside the prediction pattern once the subscription is saved by going to the ‘Planning’ tab on the subscription detail page. ‘Library’ is the branch that owns this subscription. The ‘Patron notification’ option lets you pick a notice to send to patrons who subscribe to updates on this serial via the OPAC. 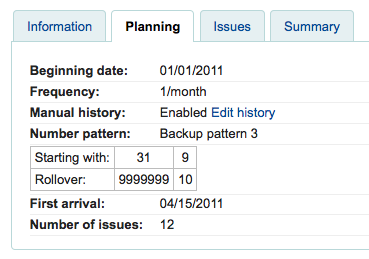 The ‘Grace period’ is the number of days before an issue is automatically moved from ‘Expected’ status to ‘Late’. This mechanism requires that the SerialsUpdate.pl cron job is set up to run regularly. 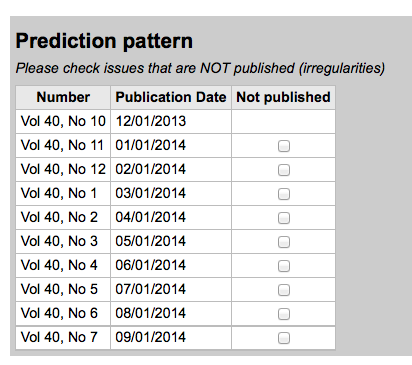 Once that data is filled in you can click ‘Next’ to enter the prediction pattern information. Without periodicy: some very specific (usually high level science journals) don’t have a true periodicity. When you subscribe to the title, you subscribe for 6 issues, which can arrive in 1 year… or 2… There is no regularity or known schedule. Irregular: The journal is not “regular” but has a periodicity. You know that it comes out on January, then in October and December, it is irregular, but you know when it’s going to arrive. 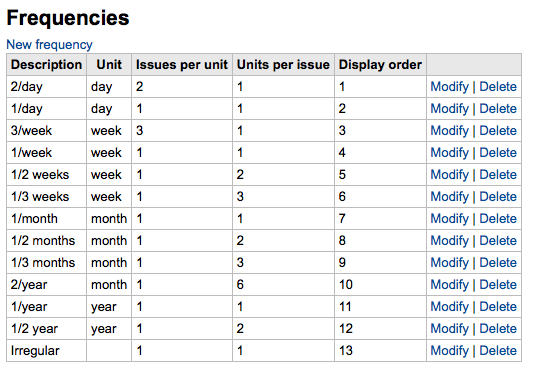 The ‘Locale’ option is useful when you want to display days, month or season. For example, if you have a German serial, you can use the German locale option to display days, etc. in German. Once a ‘Numbering pattern’ is chosen the number formula will appear. The ‘Begins with’ number is the number of the issue you’re holding in your hand. For example: If the first issue to receive is “vol. 4, no. 1, iss. 796”, you need to set up “inner counter = 0” But if it’s “vol. 4, no. 2, iss. 797”, the inner counter should be “1”. After filling in this data click the ‘Test prediction pattern’ button to see what issues the system will generate, if there are irregularities you can choose which issues don’t exist from the list presented. Click ‘Save subscription’ to save the information you have entered. Find sample serial examples in the serial pattern library on the wiki. To edit a subscription, click on ‘Edit’ and ‘Edit subscription’ from the subscription page. This will take you back to the same form as the one used when creating a new subscription. You can also batch edit subscriptions. To do so, search for the subscriptions you want to change. In the results, check the boxes next to the subscriptions to edit. The link ‘Edit selected serials’ will appear. Leave the field unchanged to keep the original values. From the search results you can click the ‘Serial receive’ link or you can click on the subscription title and then click the ‘Receive’ button. From the page that opens up you can click ‘Edit serial’ with the issue you want to receive checked. Choose ‘Arrived’ from the status pull down to mark a serial as received. If your issue has a supplemental issue with it, fill in the Supplemental issue information. Key the entire numbering in the box after “Supplemental issue” no numbering will be inherited/auto-filled from the main issue, and exactly what you key in the box after “Supplemental issue” will be auto-filled in the item record’s Serial enumeration/chronology [MARC21 952$h] (if you create item records). If you are receiving multiple issues at once, or have marked an issue as ‘Late’ or ‘Missing’ there you can click the ‘Generate next’ button below the list of issues. Clicking this button will generate the next issue for you and mark the previously expected issue as ‘Late’ automatically. 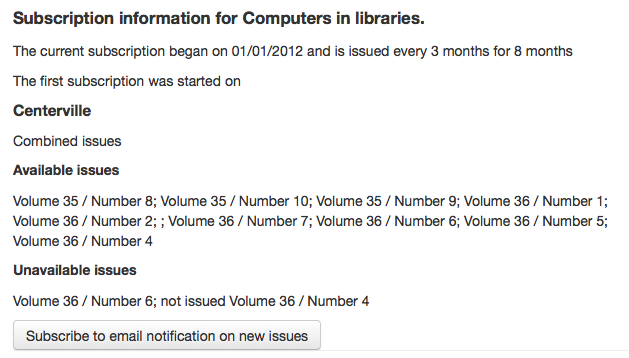 You can then check the ‘Edit’ box to the right of each issue and edit the status on multiple issues at once. 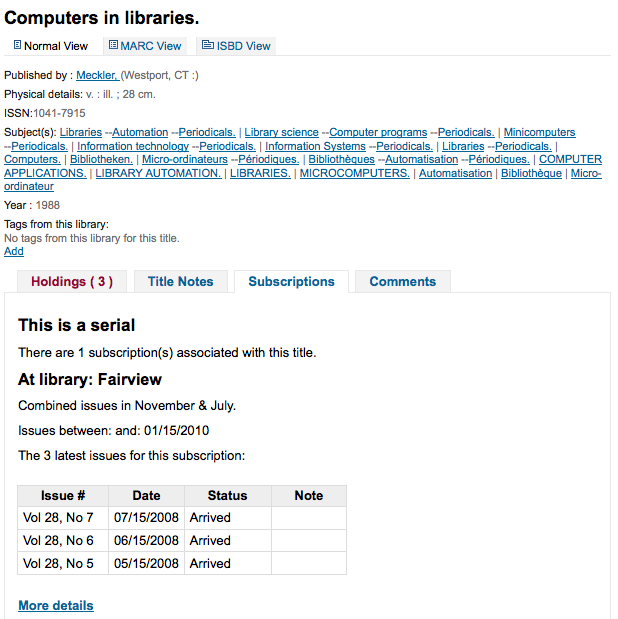 A routing list is a list of people who receive the serial before it goes to the shelf. To enable routing lists you want to set your RoutingSerials preference to ‘Add’. Clicking that link will bring you to the menu to add a new routing list. From here you want to click ‘Add recipients’ in order to add people to the routing list. 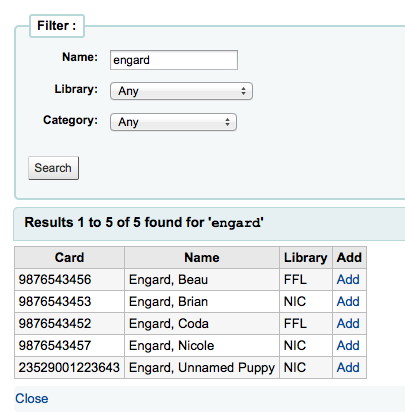 In the menu that appears you can filter patrons by part of their name, their library and/or patron category. Clicking ‘Add’ to the right of each name will add them to the routing list. When you have chosen all of the people for the list, click the ‘Close’ link to be redirected to the routing list. If the list looks the way you expect it to, then click ‘Save’. Next you will be brought to a preview of the routing list. 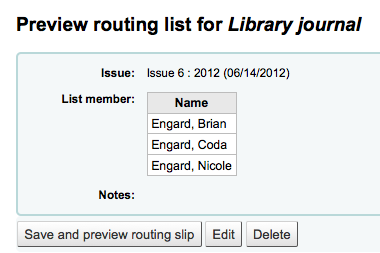 To print the list click ‘Save and preview routing slip.’ This will open a printable version of the list. If RoutingListAddReserves is set to on then patrons listed in the routing list will automatically be added to the holds list for the issue. 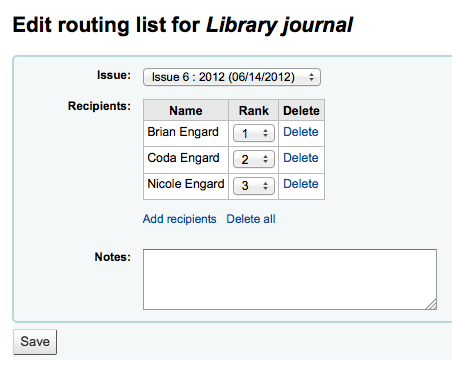 To see a list of all of the routing lists a specific patron is on visit the Routing lists tab on their patron record. Clicking the ‘Subscription details’ link will take you to the Subscription summary page in the staff client. If you are using the Acquisitions module to keep track of serial subscriptions you will see that info before your subscription details. 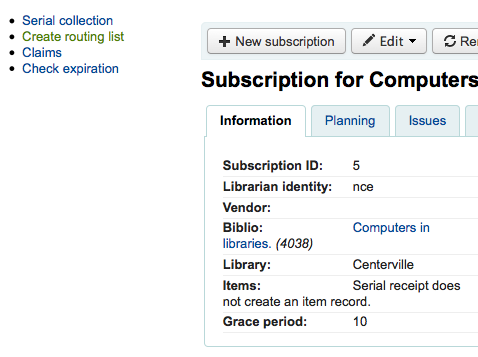 When viewing the subscription in the OPAC there will be several options. 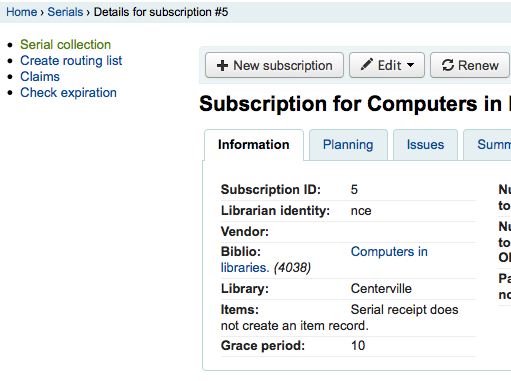 Like in the staff client, there will be a Subscriptions tab on the bibliographic record. Under this tab will appear the number of issues you chose when setting up the subscription or in your OPACSerialIssueDisplayCount system preference. Clicking the ‘More details’ link will provide you with additional information about the serial history. 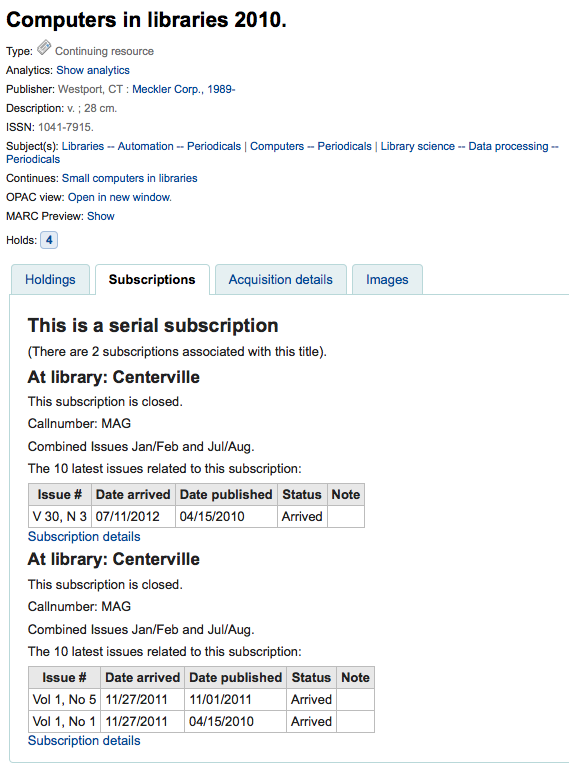 You can set the default view of a serial in the OPAC with the SubscriptionHistory system preference. From this compact display patrons can subscribe to be notified of new issues as they are released by clicking the ‘Subscribe to email notifications of new issues’ button. For this link to appear you will want to have chosen to notify patrons on the subscription itself. You can see those who subscribe to new issue alerts by going to the subscription page in the staff client and looking on the right of the ‘Information’ tab. 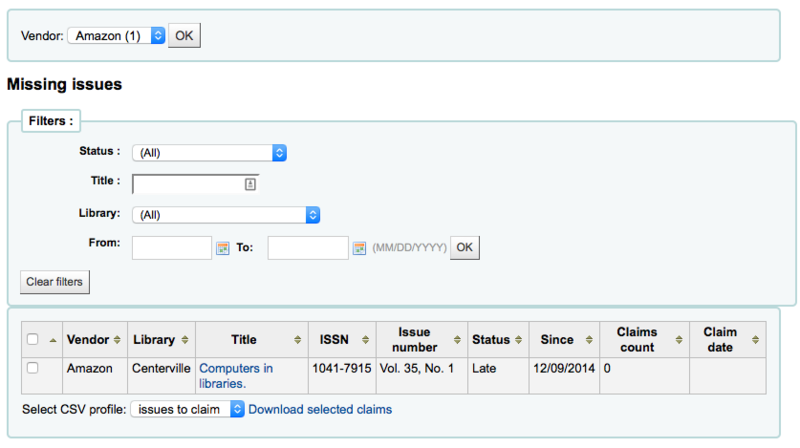 If you don’t have a claim notice defined yet you will see a warning message that you need to first define a notice. Clicking ‘Claims’ will open a report that will ask you to choose from your various serial vendors to generate claims for late issues. From the list of late issues you can choose which ones you want to send a claim email to by clicking the checkbox to the left of late issue, choosing the notice template to use and clicking the ‘Send notification’ button. 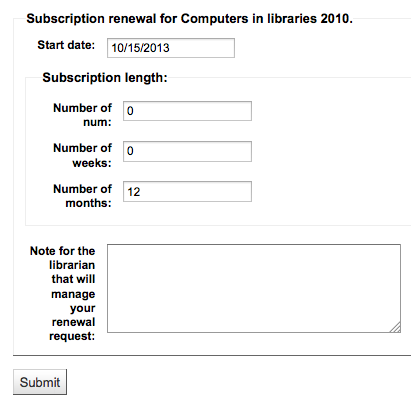 When adding serials you enter a subscription length, using the check expiration tool you can see when your subscriptions are about to expire. To use the tool click the link to ‘Check expiration’ on the serials menu. In the form that appears you need to enter at least a date to search by. 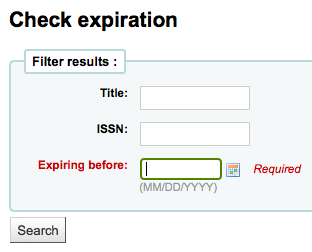 In your results you will see all subscriptions that will expire before the date you entered. From there you can choose to view the subscription further or renew it in one click. 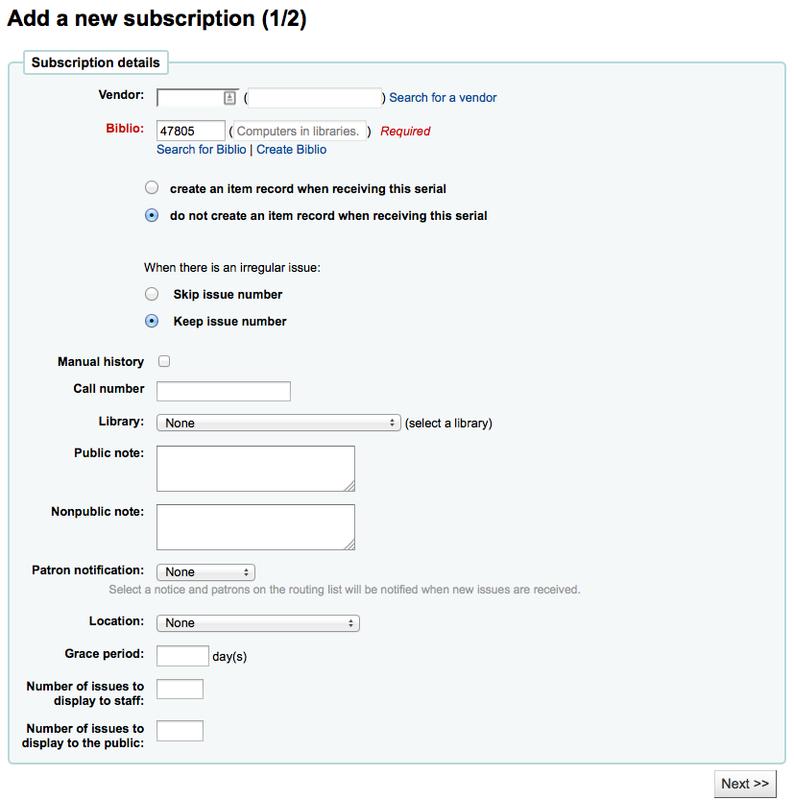 If there is more than one subscription, you can check the boxes and click on ‘Renew selected subscriptions’ to renew all the serials. The serials will be renewed for the same amount of time as their previous subscription (i.e. if the last subscription for that serial lasted one year, the serial will be renewed for one year; if the last subscription was for 16 issues, it will be renewed for another 16 issues). If your serial subscription has expired you won’t be able to receive issues. To renew your subscription you can click the ‘Renew’ button at the top of your subscription detail page. 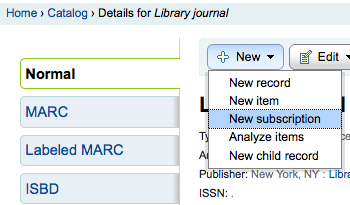 Another option is to click the ‘Renew’ link to the right of the subscription on the Serial collection page. Once you click the ‘Renew’ link or button you will be presented with renewal options. The start date should be the date your subscription period starts. 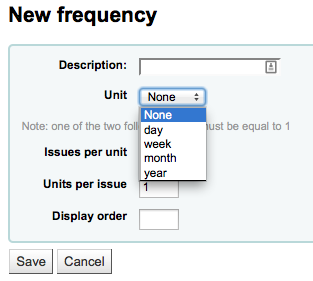 For the subscription length you’ll want to fill in one of the three fields presented: Number of issues, Number of months or Number of weeks. Finally enter any notes you might have about this renewal. 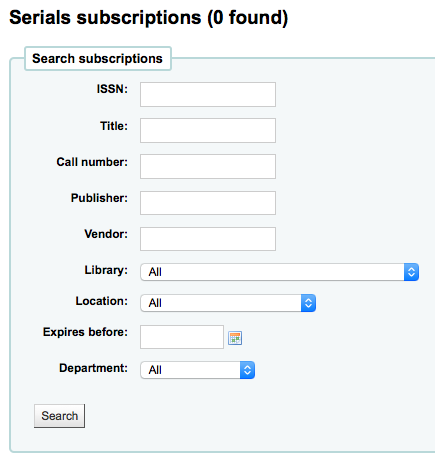 Once in the Serials module there is basic search box at the top that you can use to find subscriptions using any part of the ISSN and/or title. 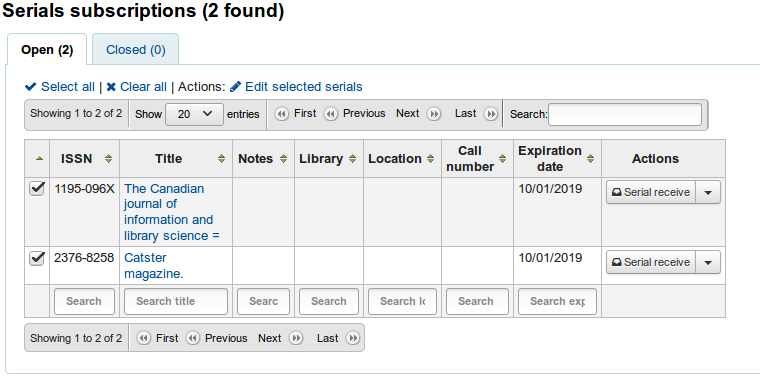 You can also click the ‘Advanced search’ link to the right of the ‘Submit’ button to do a more thorough search of your serials. From your results you can filter by using the search boxes at the bottom of each column and adjust the number of results using the toolbar at the top of the results set.